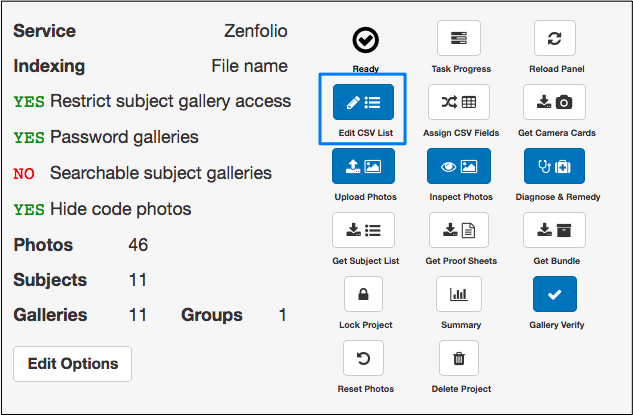 Upload and edit your CSV file using the Snapizzi List Editor. Once you have your CSV file setup properly, you're now ready to upload it to your Project. Once uploaded, you can use the built-in Snapizzi List Editor to update your Project data. Click Edit CSV List on your Project Dashboard to open the List Editor. UPLOAD: Navigate to your CSV file and click "Upload CSV". Once uploaded, proceed to the next step: Assign CSV Fields. EDIT: Click directly on any existing field to edit or use the task buttons outlined below. Navigate to your Project CSV on your computer and click "Upload CSV". Do not upload a CSV over another without resetting or you'll duplicate your Subjects. If you've made changes to your CSV and haven't generated cards yet, you can Reset List and upload again. This deletes all Subject and Group data and headers. Reset is not available after camera cards are issued. Do not upload a CSV over another without resetting or you'll duplicate your Subjects. Download all your Project data (Gallery URLs, filenames, and more). Learn more about the Subject List. Copy contents of your CSV file to your clipboard. May be pasted as plain text or into a spreadsheet application. Used to change your CSV delimiter. Use only if recommended. Click to add a new Subject row to the bottom of your CSV file. Subject data can also be edited in the Inspector. Click to easily add columns to your CSV file. This is where you can add columns like Gallery Name, First or Last Name, etc. Rename or edit your column headers (some columns not allowed).